Ants will tend to explore and travel extensively to scope out surroundings in search of food, some follow trails that have been previously exploited and some cluster around particular sources of food. They do this to maximize the amount of food that they can provide their queen with all the young she will produce. This also helps identify new areas for new nests for when the new queens are ready to go. Garden ants are dark brown almost black in colour and are 3-5mm long. They will nest underground or quite commonly under stones, paving slabs or rotten wood. Their diet consists of insects, nectar from flowers and seeds. Given the opportunity, they will eat food left out in people’s homes and gardens. The queen ant is about 7-9mm long, black in colour and can live around 12 years. 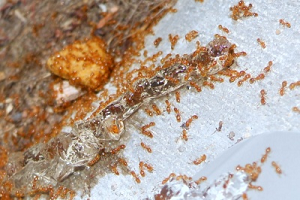 Pharaoh’s ants are a yellow-brown colour, small in size at only 1-2mm long, queens can go up to 6mm. They feed on decomposing protein rich foods, which spread harmful germs. They need heat to survive and are usually found in large heated buildings, flats, apartments and hotels. 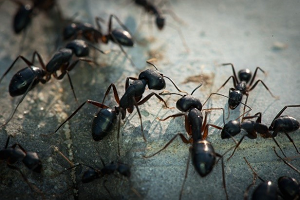 Ant control methods at home include; cleaning all areas of your kitchen so no food debris is left to attract them, covering up food and putting them in containers to restrict smell and access. Cleaning any sticky residues on worktops immediately as ants are attracted to sweet substances. Making sure that rubbish is in bags, tied securely and bins are left closed, as it will help reduce infestations in your garden. Look out and track down where they are originating from and seal off their entry points. Call City Serve Pest Control for our expert technicians to identify and remove any colonies and effectively eradicate the problem.